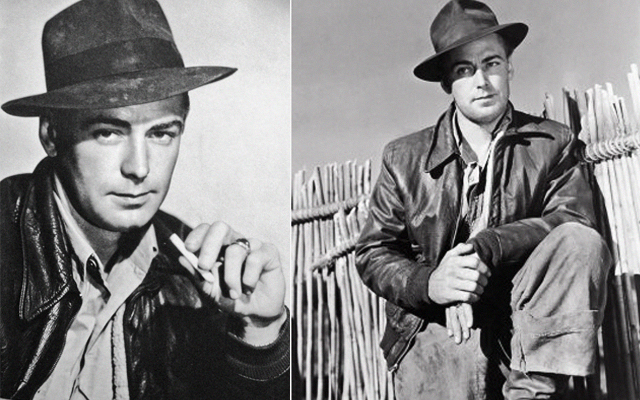 Alan Ladd was an actor of Hollywood's Golden Era who, perhaps small in stature, became a star of colossal proportions. Few characters in movie history have a more powerful impact on audiences than that of SHANE (1953, George Stevens), as they continue to yell Shane, come back! Time has somehow dimmed the extent of the spectrum of a legend that would be more present had it not been for his premature passing and the fact that his life emphasizes the contradictions of era that was not at all as easy and magic as we tend to perceive. The prevailing contrast of his calmed and unaffected expression with the force coming from his voice and glance, was his performing trademark. His eyes often revealed that deep down inside of him there was an eruption persistently restrained. Film noir benefited enormously from that quality. 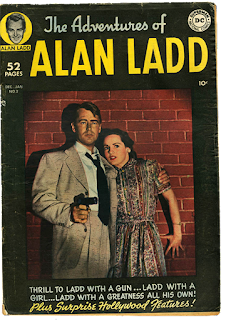 With performances like the one in THIS GUN FOR HIRE (1942, Frank Tuttle), Ladd defined a series of characters that would transform the genre and immediately connect with spectators. His legacy in film history is undeniable and influenced future generations. 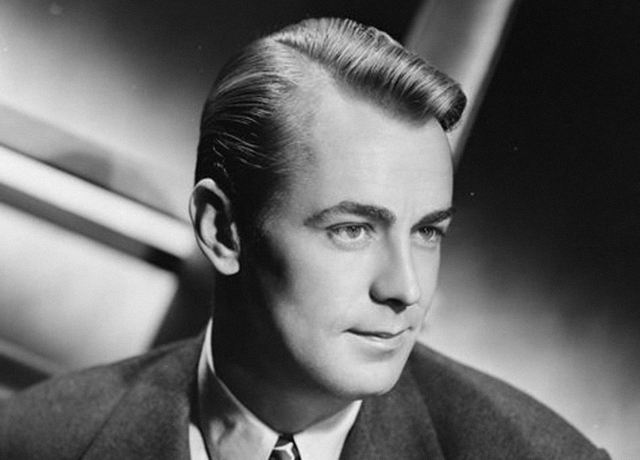 In this post we will review some of those lesser known facts about Alan Ladd that will capture the importance and trail of enchantment that Ladd achieved onscreen and that definitely set him aside as an exceptional actor. 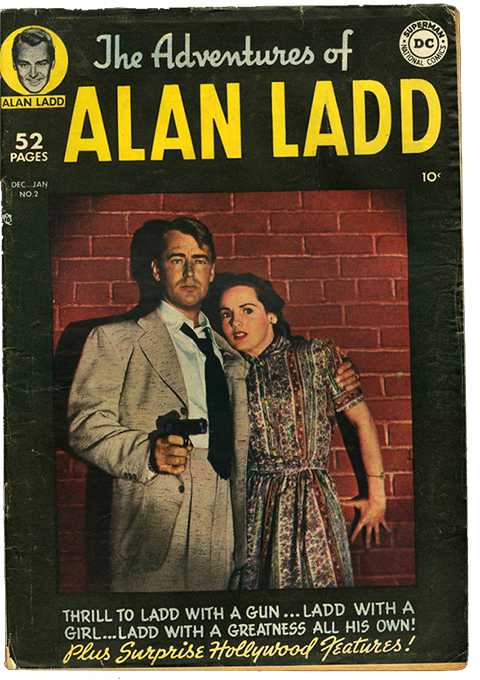 Years prior to his big success with the part of Philip Raven in THIS GUN FOR HIRE, Alan Ladd's road to stardom had consisted of a series of unsuccessful attempts. Too blonde, too short, Hollywood's standards were implacable. He decide to move towards radio, where his fine baritone voice caught the attention of former actress Sue Carol, who would later become his wife. From that moment on, his film career took off and the rest, as they say, is kismet. Though his radio interventions were significantly limited, he continued to deliver wonderful performances such as the one in the noir radio series Box 13. He plays the bold newspaperman and mystery novelist Dan Holliday whom, in search for new stories, publishes the following ad "Adventure wanted, will go anywhere, do anything -- write Box 13, Star-Times". CHINA (John Farrow) –released by Paramount Pictures back in 1943– would be otherwise totally forgotten, if it weren't for the fact that sería Alan Ladd's performance and outfit were clearly an inspiration for my beloved Indiana Jones. Set during China's Japanese occupation before WWII, this war drama chronicles the vicissitudes of David Jones –Ladd–, a ruthless trader who helps reluctantly Carolyn Grant. Played by Loretta Young, she is a teacher desperately trying to protect her students from the danger that surrounds them. William Bendix is Ladd's sidekick in this gruesome story. Besides SECRET OF THE INCAS (1954, Jerry Hopper), if we are to track the reference for the look and even the surname of the character immortalized by Harrison Ford, we must give this film a lot of credit. Not only his fedora, brown jacket, and khakis but also his cynicism and wits are remarkably similar to Ladd's performance and characteristic presence. Additionally, the truck that Ladd and Bendix drive is just like the one transporting the arc of the Covenant in RAIDERS OF THE LOST ARC (1981, Steven Spielberg) and even the whip is mentioned in Ladd's film(1). Could there be more things in common? It is impossible to talk about Alan Ladd without highlighting the enormous popularity he enjoyed. During the forties and the fifties, Alan Ladd stayed at the top of the highest box-office actors and absolutely adored by audiences all over the world. As a result of that, he received in 1954, an award from Photoplay Magazine(2) alongside Marilyn Monroe, as the most popular male actor of his time. 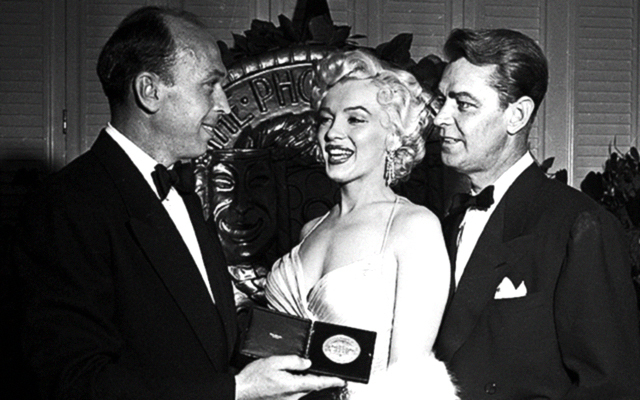 Delivered each year, Monroe won hers for HOW TO MARRY A MILLIONAIRE (1953, Jean Negulesco)and Ladd got his for SHANE. Even DC Comics published a series of nine special issues of a comic called The Adventures de Alan Ladd (1949-1951) featuring stories with him as a protagonist. Nº 2 of The Adventures of Alan Ladd (1949). Few will remember now that Alan Ladd interpreted to the famous character created by Scott Fitzgerald, in the version that premiered in 1949 of THE GREAT GATSBY (Elliot Nugent). Despite having been practically forgotten, the truth is that the role of Jay Gatsby was an important one for him. He came to confront the studio that had become his realm for more than ten years, so that they agreed to his intervention in a film that was far from the image that the public had forged of him. As expected, this noir adaptation didn't score well at the box-office. However, his performance remains unfairly overlooked. As his son David Ladd explains in the documentary Alan Ladd - The True Quiet Man (1999, Gene Feldman & Suzette Winter)(3), for many reasons, his father identified himself with this character and remained, tied with SHANE, as his favorite movies. For many reasons, he really understood the character and his approach remains for me the most authentic of all the movie adaptations that have been made over the years. Some parts seem to be destined to be played by one specific actor or actress, who is forever linked to that character. Such is the case with Shane. I for one couldn't imagine anyone but Alan Ladd in that buckskin outfit and becoming the iconic representation of a redeemed hero in western film history. However, it all may well have turned out very different. The director, George Stevens had Montgomery Clift in mind as his lead star, as he adapted Jack Schaefer's(4) novel –on which the film was based–. But not only that, he also thought of William Holden and Katharine Hepburn as the Starrett's. Luckily, as much as though I admire them both, they weren't available to play those parts. Alan Ladd, Van Heflin, Jean Arthur's brilliant performances and, quite frankly, those provided by the whole cast, are virtually impossible to surpass. In the end, Stevens was so captivated with Alan's performance that he even offered him the role of Jett Rink in GIANT (1956), years later. As in the case of Shane, he declined and was then the turn of James Dean to make history in another George Stevens film. So as the saying goes, if it is meant to be, it will be. One could venture to say that without Alan Ladd, STAR WARS (1977, George Lucas) might have never reached the screens. Am I exaggerating? Absolutely. Am I wrong? No way. 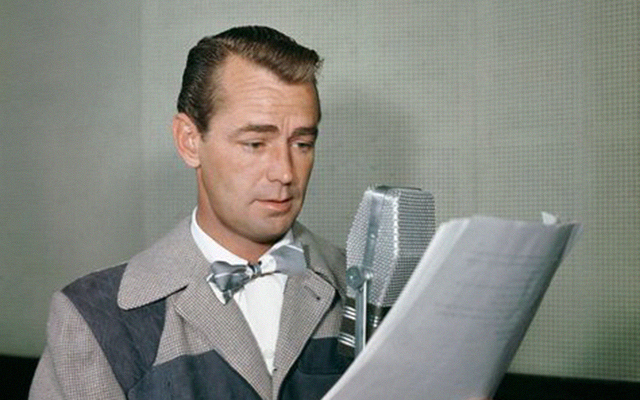 Alan Ladd Jr., his oldest son, became one of the most prestigious executive producers of all time. Devoted to cinema but working behind the scenes, Alan started his activities as an agent. Judy Garland or Robert Redford were once his clients during the 60s. 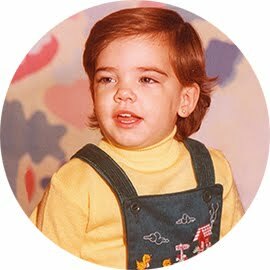 Years later, we would start his way as an independent producer, first in London, until he returned to the US in 1973 to end up becoming head of 20th Century Fox, among other major studios. 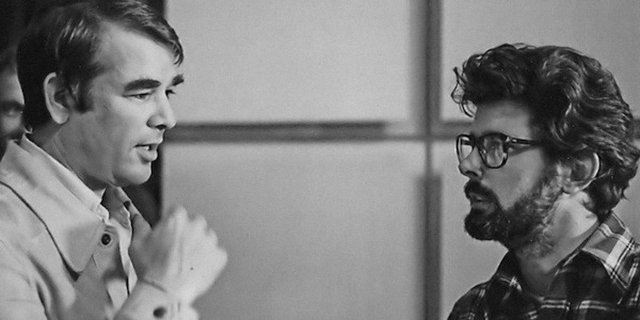 Legend states that George Lucas presented his then sci-fi project to Universal and United Artists, quite unsuccessfully. Ladd Jr., who was impressed by AMERICAN GRAFFITI (1973), decided to go all in and take a chance on Lucas' vision and imagination. I would need another post to write extensively about Alan Ladd Jr. film successes and his own instincts as a producer. As an example, I could name: YOUNG FRANKENSTEIN (1974, Mel Brooks), ALIEN (1979, Ridley Scott), CHARIOTS OF FIRE (1981, Hugh Hudson), THELMA & LOUISE (1991, Ridley Scott) or BRAVEHEART (1995, Mel Gibson). This is where I would like to conclude my compilation on these lesser known facts about Alan Ladd. Thank you all for reading this post and see you in our next crusade. Another curious aspect of the film CHINA (1943) is a dialogue between Alan Ladd who plays the protagonist named David Jones and Loretta Young's character, mentioning a whip. Interestingly enough, Indiana Jones also uses a whip and it became part of his character. More information in TheRaider.net. Created in 1911, this magazine aimed at fans of movie stars, was considered very influential in the film industry especially in the 30s. Filled with personal stories and scandals, these magazines were a favorite for film devotees. You can see a sample in the Media History Project. TV documentary made in 1999 on Alan Ladd's persona that reviews all his cinematographic trajectory. Available through YouTube. (1907-1991) American writer known for his stories set in the Old West. 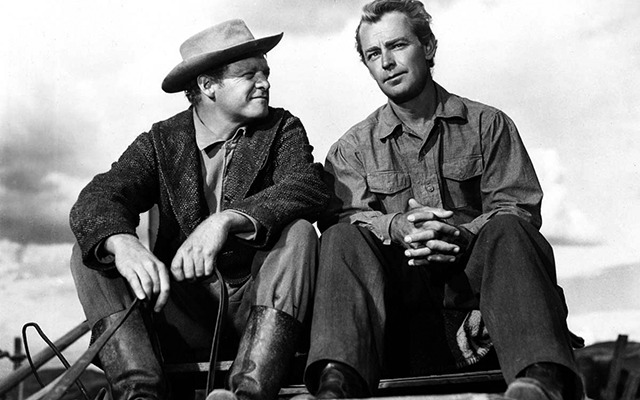 One of his most famous was Shane (1949) adapted for the screen by George Stevens. Excellent Blog . I came to it via Silver Screen Suppers Columbo Test Cook! Box 13 radio is excellent as I listen to a lot of old time radio also. Very Underated . I had forgotten about 'China' the look is absolutely Indy ! But then the whole thing was always a throwback/tribute to those great gaudy adventure features of the 40/50's . I'm sure it's all deliberate. Never seen any issues of the comic, but I'm sure they cost a bomb now. The Blue Dahlia is favourite of mine also with the great William Bendix featured too. Thank you so much, Mark. Great to read your comment! Yes, I think Box 13 was a great idea and Alan's voice was so powerful for radio. About "China", absolutely Indiana Jones is a tribute to all those classic adventure films and also many David Lean greats such as Lawrence of Arabia or The Bridge on the River Kwai. No wonder Spielberg and Lucas hit so hard on audiences, they had great taste. I am not sure about the comic's cost but I guess so, too. "The Blue Dahlia" is great, I am quite partial of "This Gun for Hire" myself. I agree on William Bendix, too. If you like Alan Ladd, I am finishing translating a post on "Shane", so stick around!